It's legitimately impressive how directors Alastair Fothergill & Jess Wilson, with writer David Fowler, create the narrative they do. Penguin Steve is depicted as a kind of bumbling everyman just trying to do a good job, though we begin the film seeing that he is straggling far behind the other males headed to prepare nesting grounds for their prospective mates. Steve isn't quite as macho as the other penguins, not quite as good at gathering rocks but he does find a mate and start his family. The raw footage they have though, editing aside, is phenomenal. There is one bit when Steve is gathering rocks to build a nest and every time he drops one off and walks off-screen a nearby penguin steals his rock! The unedited comic timing of it is unbelievable. Apparently the crews filmed for about two and a half years to get the footage used in Penguins and I honestly cannot imagine what it must be like to watch twenty-thousand-plus hours of footage looking for the right takes of penguins slipping on ice to build the "lovable loser Steve" character. After Steve's eggs have been laid, a Katabatic weather system moves in, which is primarily winds with higher moisture density being muscled around by antarctic temperature changes. The narration in the film describes them as "a hurricane-strength blizzard" that brings with it temperatures of -40 and driving snow for three days. Presumably these crews were present for at least some if not most of that which, again, is astounding to me. Penguins is rated G, and I can attest that there are no violent onscreen penguin deaths, though you do see some penguins pulled bloodlessly below the ice by leopard seals, one of the films two major animal villains. The other are the South Polar Skua birds, which are even granted a great Sinister Villain Laughing shot after we are told they are penguin eaters. It's honestly both pretty funny and pretty creepy in equal measure. Heads up: You must like Ed Helms at least as much as you like penguins to see this because it's largely a one-man show. I've got no problem with Helms but I feel like having him narrate and do Steve's inner monologue is an odd choice. Ed Helms has kind of made a career out of dorky Dad-jokes, which is a pretty spot-on fit for the Steve character, honestly, but I just don't understand why we needed a separation between things the Narrator would say and things Steve would. (Office fans, you do get some low key Andy Bernard "Roo-doot-doodoo" scatting at one point). The music in Penguins helps a lot of things land, whether it's the tasteful penguin love-scene set to REO Speedwagon's "I Can't Fight This Feeling" or the gathering-food montage complete with fast-motion footage (my favorite bit of the film) set to The Average White Band's "I Got Work to Do". Beyond the needle-drop songs (which also feature Patti Labelle and White Snake if you were curious), the score by Harry Gregson-Williams also does a lot of emotive heavy-lifting. My biggest quibble with Penguins is that it could have leaned a little harder into the informative, educational aspect of documentaries. Obviously Penguins is intended more to be family entertainment, but when they introduced the Katabatic winds, my first thought was that I wish they'd have put that word on the screen. Maybe the species names too. Nature docs, especially the old school Disney ones, were always as informative as they were entertaining and I think giving the kids in the audience a few more things that might spark an interest within them couldn't hurt. 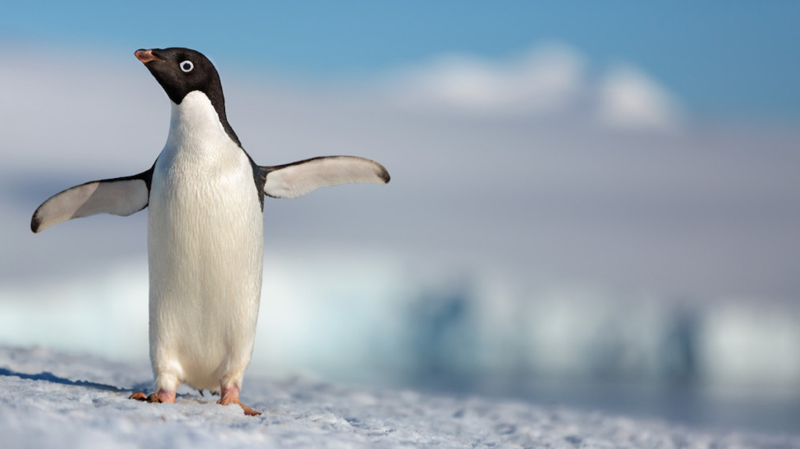 All in all, Penguins delivers a decent story with some genuine laughs and lovely photography, though it is a little light on educational content. If you need an added incentive to see Penguins, apparently some of the first week's proceeds will go to penguin preservation agencies. If, however, the educational thing is non-starter for you, I'd recommend Penguins: Spy in the Huddle, a 2013 BBC three-episode miniseries narrated by former Doctor Who alum David Tennant. See? Full circle.